UPDATED: Tue., Feb. 5, 2019, 6:47 p.m.
Two “Excellence in Agriculture” awards were presented Tuesday at the Spokane Ag Expo & Pacific Northwest Farm Forum. The federal government’s 35-day shutdown hampered Art Douglas’ ability to prepare a weather forecast for the region’s farmers. Douglas, aka “The Weatherman,” said he couldn’t get into government weather data until Saturday. 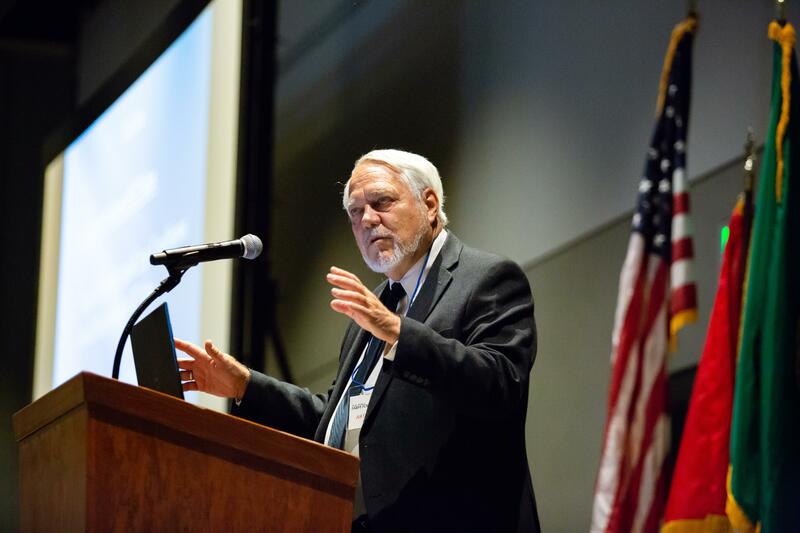 So his talk Tuesday morning at the Spokane Ag Expo & Pacific Northwest Farm Forum fell short of the “true forecast I normally make,” the Creighton University professor emeritus of atmospheric sciences told the crowd. Douglas is a popular headliner at Ag Expo, where he has delivered a weather outlook tailored to agricultural producers for three decades. Douglas expects a “so-so” El Nino to influence global weather for the next six to eight months. In Eastern Washington, Eastern Oregon and Idaho, a cold February will give way to milder temperatures in March and April, he predicted. Spring will be a bit drier than normal, but still deliver close to average rainfall. “You’re going to get some moisture. You’re going to push along. And hopefully, it will all work out,” he told several hundred farmers at the Spokane Convention Center. July and August will bring “some heat” and drier than normal conditions, Douglas said. The hotter weather isn’t ideal for crops and could set the stage for wildfires, he said. But Northwest growers will fare better than their counterparts in the Midwest, where “I think we’ve got a fingernail-biting situation,” Douglas said. He expects the Midwest to be dry this summer but said it won’t sink into drought. El Nino will bring mixed results to other growing regions around the world. Douglas said Australia is already in the midst of a severe drought affecting the country’s cattle production. South Africa and southern India also will experience drought this year, he said. Dry conditions will persist in Brazil, diminishing that country’s corn and soybean crops, Douglas said. That’s significant for world markets because China plans to replace U.S. soybeans with soybeans grown in Brazil to avoid tariffs, he said. In Asia, China is on track for a near average weather year, and conditions also look favorable in northern India, where wheat is grown with irrigation, Douglas said. For the Crimea region in Ukraine and southwest Russia, however, the winter wheat crop got off to a bad start during a hotter than normal fall, which bodes ill for wheat production in 2019, he said. Bruce Nelson of Nelson Farms Inc. came to the Ag Expo specifically to hear Douglas’ weather talk and outlook for global commodities. The Spokane Ag Expo & Pacific Northwest Farm Form continues through Thursday at the Spokane Convention Center and Spokane Arena. Published: Feb. 5, 2019, 5:34 p.m. Updated: Feb. 5, 2019, 6:47 p.m.